Music history: so far he's been unwilling to brag about his music biography, but maybe we'll be able to pull something out of him with time. We've only found out that together with the Lebeda brothers he started a side business in the Brzdari band (country section and Johnny Cash Revival). Indeed his main asset, has been and always will be his natural eloquence, aside from his inherited beautiful voice color. Due to his eloquence he speaks for the Brzdari band, fortunately only on the stage. 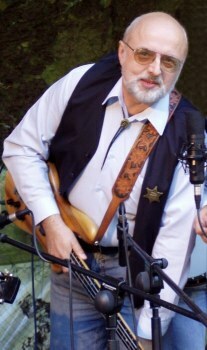 This skill also got him the position of the MC of the following festivals Kutnohorská kocábka, Kolínský ostrov, Červenopečecká Pecka, Lípa u Havlíčkova Brodu and above all Banjo Jamboree.